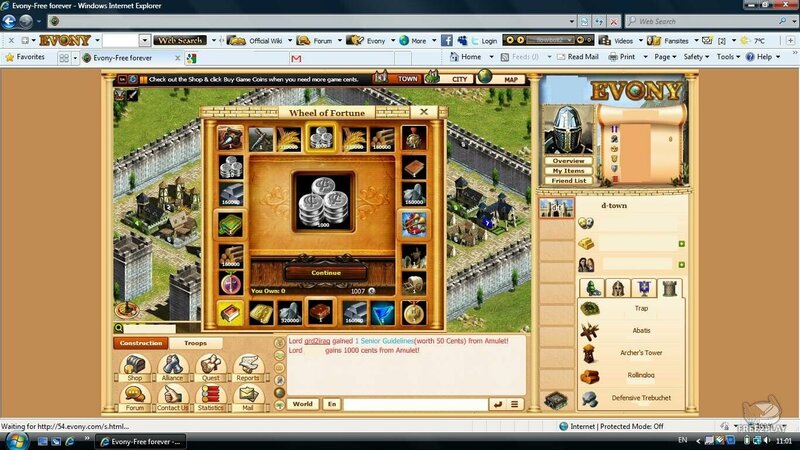 Evony is a MMO RTS Browser game. 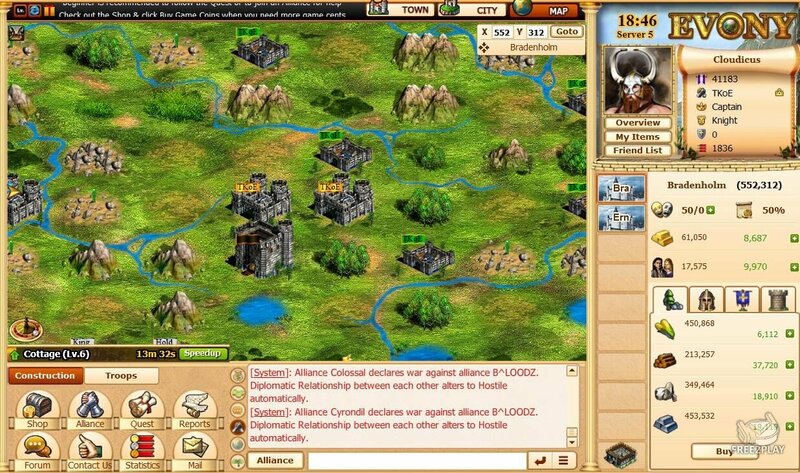 The game is set in medieval times where a player must to establish a city and begin developing technology and building supporting structures to generate armies and resources for the purpose of attacking other players and computer controlled oponents. Evony is set in a persistent world–when a player logs out, the game continues. 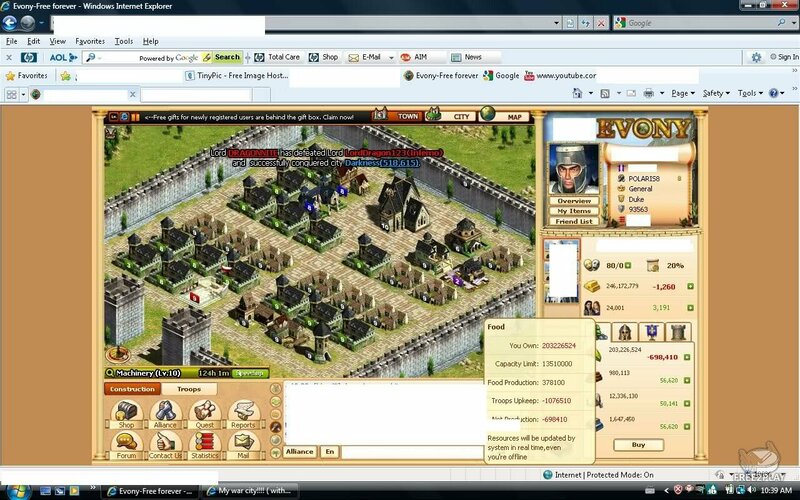 Evony features player versus player (PvP) gameplay, making it possible to attack another player’s cities. Evony offers many items through its Item Mall, most of them in some way accelerating the player’s progression through the game. 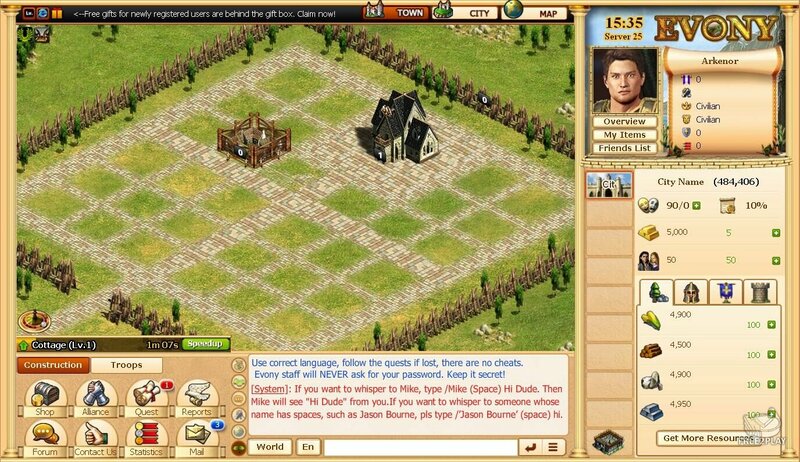 A new player is given “beginner’s protection” which prevents other players from attacking their cities. This gives new players the opportunity to get accustomed to the game before the challenges begin to surface. The construction of buildings, researching of technologies, and training of units consume time and resources and have various prerequisites. Each building and technology can be independently upgraded from level 1 to level 10. Initial construction may take from under a minute to half an hour, during which the player must find other aspects of the city or army to manage. Each upgrade requires double the cost of the previous level in every resource and time required. The game suports over a dozen technologies, and allows the player to control up to ten cities through gaining of titles and rank, both requiring medals gained by buying in-game coins or by attacking valleys. Each of these cities has 74 building slots at their top level. There are queue options for army unit production and wall defenses, but not for building and research. Prestige is a measure of a player’s rank in the game. Players gain prestige by following quests, building and upgrading structures, training armies and successfully attacking valleys and cities often during the game. Honor is also a ranking system; however, it only changes with a successful or unsuccessful attack of or defense against another player. The overall ranking system that is displayed in the players window is based solely on their prestige compared to the remaining server population. Evony allows the player to control up to ten cities depending on title, not rank. To increase the number of cities the player can control, the player must obtain higher titles through the collection of certain medals. Evony has two different monetary systems. The in-game monetary system revolves around gold. Gold can be obtained by completing quests and by taxing the player’s population. It is also possible to sell resources for gold on the marketplace to other players. In lieu of this, a player can use real money to buy game cents with which to purchase items and resources from the in-game shop. A player begins by acting as mayor of a city. The player gives instructions on production and construction with the initial resources. The resources in the game are Food, Lumber, Gold, Stone, and Iron, and the city’s population. As with many RTS games, one first has to increase the city’s population and hourly resource-collection rates through the construction of certain buildings in the city, and then start developing other aspects of their city and building an army.